Since its inception in 1973, Peer Assisted Learning (PAL), or Supplemental Instruction as it’s called in the US, has benefited thousands of learners around the world. A wide and growing body of research has proven its benefits, which extend beyond the student participants to the group leaders, teachers and universities. If you are just joining us now, PAL is an educational practice in which students support each other in their learning. So far in previous articles, we’ve given an introduction to PAL and looked more closely at the theory behind PAL. In this article, we’ll explain some of the key benefits of PAL for each stakeholder group. The transition to university is difficult for many students as they are challenged in terms of their academic ability, study skills and on personal levels. If they feel ill-equipped to deal with these challenges, this often results in lowered self-esteem, poor grades and possibly dropouts. This is precisely what PAL was designed to address – student success and retention rates on historically difficult courses. On an academic level, it’s been proven in numerous studies, including by Hurley & Gilbert (2008), that students who regularly attend PAL sessions achieve better grades. PAL sessions allow students to ask questions freely, discuss things and work collaboratively in a safe and private environment, which helps deepen understanding of course material (Hurley & Gilbert, 2008) (2). Increased student success isn’t just the result of a better understanding of course material. The session leaders act as role models for new students, helping them develop better study skills, revision tactics and lecture preparation. Interpersonal skills, teamwork and independence are also improved, particularly if the PAL sessions are structured around collaborative and cooperative learning activities where each student has a task to contribute to the group. Additionally, there is a personal benefit for students participating in PAL schemes. 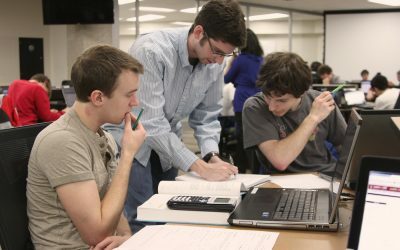 Andrew and Clark (2011) show that such schemes work by addressing fears that many students have by giving them a sense of belonging, especially during the first year at university (3). This helps to improve confidence and a motivation to learn which, as we mentioned here in this article, Tinto (1993) says is critical for student success (4). 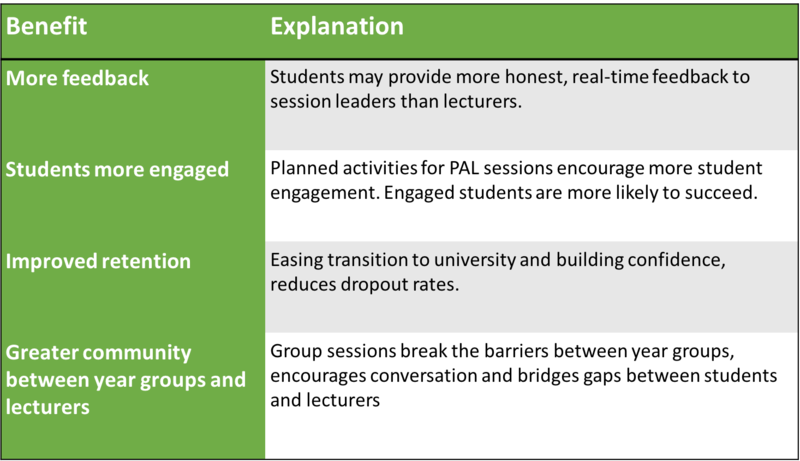 Although PAL was designed to support first year students in order to improve retention rates for universities, benefits for the session leaders (typically 2nd or 3rd year students) are also widely reported. As with the student participants, these can be broken down into 3 benefit categories: academic ability, study skills and personal levels. Now that’s not to say that you, our highly valued readers, aren’t learning as you read this. Nor is it to say that this only applies to the session leaders. We’re saying that once you have a chance to talk about this article and PAL, you are deepening your understanding. This also applies to the student participants who get to discuss topics and ask questions they wouldn’t be able to in a traditional lecture setting. A report by Chris Keenan in 2014, “Mapping student-led peer learning the UK”, concluded that the leaders acquire higher-level personal and professional skills, deepen their own subject learning, improve grades, enhance relationships and inter-cultural awareness, and have greater employability prospects (6). 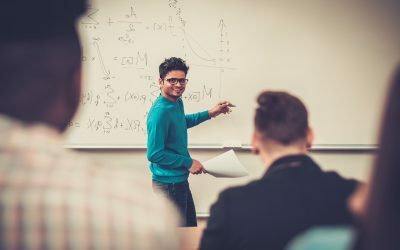 In a landscape of ever increasing expectation and competition, not to mention the introduction of the Teaching Excellence Framework in the UK, the need for student satisfaction and retention has never been higher. Properly implemented PAL programmes, lead to more confident, motivated and happy students. This in turn, helps the performance of lecturers, departments and universities. The table below, adapted from a PAL benefits summary resource from a Sheffield Hallam University blog (7), identifies some of the key benefits for departments. Aside from improving performance as measured by student results, satisfaction and retention, effective PAL programmes could help in differentiating departments and universities entirely. The world is now constantly connected and its level of integration is deepening. Although there is no replacement for face-to-face interaction and discussion, technology provides an additional mechanism to support students and PAL programmes. This can only enhance the benefits of PAL and aid in developing entirely new models of teaching and learning. In a roundabout way, the quote above by Benjamin Franklin serves to illustrate my point. I was discussing the benefits of PAL with a colleague, making notes and planning what to write. He mentioned this quote by Benjamin Franklin (which nicely sums up PAL), so I promptly googled it. It turns out that they are words that he never actually spoke. They were adapted from the Chinese Confucian philosopher Xunzi, first translated into English in 1928 (138 years after Benjamin Franklin died). I learned this thanks to a man called Robert Frost (8), via Quora, a website which is effectively a global peer assisted learning site where people share knowledge. To conclude, this article has looked at some of the benefits of PAL programmes for key stakeholder groups. For student participants and leaders, PAL helps them to deepen their understanding of course material, develop important soft skills, build confidence and improve their performance. For departments and universities, happier and more engaged students lead to more feedback, greater satisfaction and retention. Technology and its potential role in PAL has been touched on, something we’ll look at more closely in a later article. We hope you enjoyed the article. If you’re looking for something more practical, we recommend downloading our FREE guide on Questions to Ask Before Starting a Peer Assisted Learning Scheme. One more thing before you go – the Learnium platform supports collaborative and peer assisted learning. If you’d like to find out more, please contact us. Peer Assisted Learning (PAL), or Supplemental Instruction, has become a global phenomenon since its conception in 1973 by Dr. Deanna Martin at the University of Missouri–Kansas City. Along the way, the practice has developed a variety of names and implementation models, but its overarching outcomes remain the same – to enhance students’ learning, experience and ultimately increase student retention. If you work in education, you may have come across the phrase “Peer-Assisted Learning” (PAL). Often referred to as Peer Assisted Study Support, Supplemental Instruction, or rather intriguingly, Shadow Modules, PAL is a scheme in which students support each other in their learning. 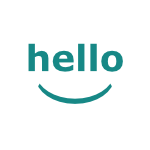 Our monthly newsletter is packed with great learning and teaching content, news about the education sector and the occasional update on our products. We don't spam & you can unsubscribe at any time.